This is Part I of a multi-part series chronicling my motorcycle adventure from Tokyo to Sapporo and back again. On a crisp June morning, I left Tokyo and headed for the Tohoku Expressway. I would head north as far as I could go in a day. 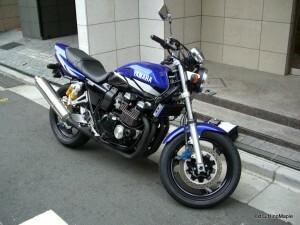 I started by racing to the Tohoku Expressway which was about 30 minutes away in the city. In Japan, each expressway is owned by a different company, rather than the government, so taking the regular roads in the city is cheaper and sometimes faster. Within Tokyo, it can be faster to take the regular roads, but often it’s faster to take the Shuto Expressway (the only expressway in central Tokyo). I saved a little money, but in general, once I got close to the Tohoku Expressway, traffic was backed up and my plan to save money and time went out the window. I only saved money. Once I was on the highway, it would be a short 9 hour trip to Hachinohe, about 700km. I took many stops along the way. 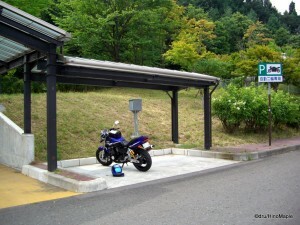 Along the expressways in Japan, every 50 km or so, there is a Service Area or Parking/Pit Area (SA or PA). These are very convenient. They often have local foods during the day, gas stations, and sometimes kid parks and dog parks. It’s a great way to stretch your legs and relax on long road trips. Making use of these SAs and PAs are essential. All expressways in Japan are private roads, and thus, you have to pay to use them. Because of this, you cannot enter and exit any expressway without paying. You can also save money if you travel farther in a day, or if you travel at certain times. Because of this, I decided to go all the way from Tokyo to Hachinohe. Hachinohe is actually one of two end points for the Tohoku Expressway. The main branch goes to Aomori, the biggest city in the Northern region of Honshu, while a Hachinohe branch expressway runs to Hachinohe. The Tohoku Expressway itself is not a very interesting expressway. It’s pretty straight and boring. Once you are on the Hachinohe branch, things look nicer and more natural. 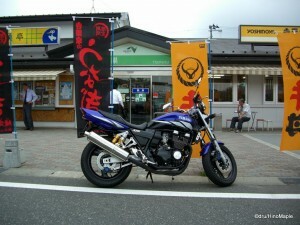 Being on a motorcycle, you will also experience the changes of traveling 700 km North of Tokyo. Every 100 km felt like I lost about 2C. Another PA. They usually have dedicated Motorcycle parking. Hahinohe was a nice little town, the first time I passed through. It’s relatively small, but unfortunately, all of the roads are curved. This made me disoriented and I always got lost. It took about 20 minutes before I found a police station and got directions. I wanted to head north to a small city called Mutsu, and the highway was impossible to find. Once the police pointed me in the right direction, everything went smoothly. Along the way, I stopped at a park near the town of Misawa. Misawa is a very small town with absolutely nothing. It’s mainly a town for the Japanese Self Defense Force and American military. The park I visited was very little small, but I was able to see and enjoy the Pacific Ocean a little. The park was completely devoid of life. I took this opportunity to relax a little and to start enjoying my trip. This was also my first encounter with Japan’s infamous “tetrapod”. They are 4-8 legged concrete “jacks” that are placed in the water to absorb the force of the waves. The purpose of them is to save the coast from eroding and protect any wharfs from typhoons and such. While I feel this is necessary in some places, Japan seems to go overboard with them. They are placed in the oddest places and excessively so. 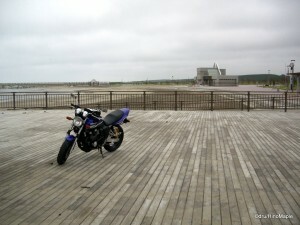 Once I was finished with the park, I continued north in the Shimokita Peninsula. It’s a very beautiful place. 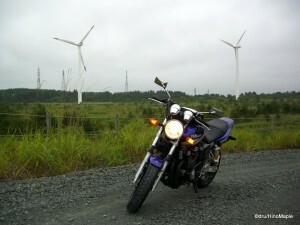 There are many windmills collecting energy for the area. It provides a very unique look at technology and nature trying to interact with each other. By nightfall, I had reached the town of Mutsu. It is a small city that few Japanese people even know of. It’s a quaint little town, but in reality, there is nothing special about it. The area is known for its sciences, but little else. While I don’t really recommend this place, if you need a base to get out and about in the area, it’s a nice central place. This was also the destination of leg one. It took me one full day, and I was completely exhausted. This entry was posted in Automobiles, Tohoku and tagged American Military, Expressway, Hachinohe, Honshu, japan, Japan Self Defense Force, JSDF, military, Misawa, Motorcycle, Mutsu, Northern Japan, PA, Parking Area, Penninsula, Pit Area, riding, SA, Sapporo, SDF, Service Area, Shimokita, Shimokita Peninsula, Shuto, Shuto Expressway, tetrapod, Tohoku, Tohoku Expressway, tokyo, Tokyo-to by Dru. Bookmark the permalink.